A mid-sized sedan comes with many perks a smaller car doesn't. Drivers don't deal with issues large-sized models come with, either. 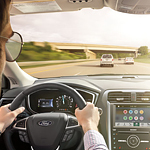 With the Ford Fusion, consumers take advantage of scores of benefits. Interestingly, the model comes with a host of technological advances drivers may love. The LCD SmartGauge with EcoGuide presents one of the more intriguing aspects of the sedan's tech benefits. The LCD screen provides a window into actions a driver can take to make a ride more energy efficient. Access either the Engage or Empower modes to utilize the hybrid's battery or fuel sources as desired. Regenerative braking represents an original tech feature with the vehicle. Regenerative braking recovers a significant amount of kinetic energy friction commonly eradicates. The energy goes back to the battery for later use. Maybe later you could take the Ford Fusion out for a test drive through local streets. At Dokmo Ford, we have many models for you to check out.